Theirs is the best forecast model in the world; and I grew up in England — so I get to visit friends and family each year. The "Centre," as it is known, is an independent international organization, supported by 31 countries who have decided to pool their efforts to tackle something that none of them can do as well alone: global weather forecasts for the next two weeks, and seasonal forecasts for the next six months. Their efforts have been very successful, because the Centre is under scientific direction, rather than political control. The director and senior staff are scientists or computer specialists who are free to focus on their central objective — improving their global analysis and forecast system for the atmosphere, oceans and land. This is a very large computer model, running on one of the biggest computer systems in the world. The present system was built by IBM, and it is upgraded every couple of years so the forecasts can provide better details of fronts and storms. Every day this analysis-forecast system takes in millions of observations collected by surface weather stations and ocean buoys, weather balloons, aircraft and dozens of satellites that look down at the earth. Its task is to integrate them into the global model to improve our picture of the current global situation; and then to forecast in some detail the statistics of the evolution of the weather for the next one to two weeks, and in broad outline for the coming season. It is very satisfying to watch the forecasts improve a little every year, as we understand how to model better what is going on. The Centre provides forecasts to Africa, and to the World Meteorological Organization and other international organizations. The United States is not a financial supporter of the European Weather Centre. We have our own weather forecast models — the National Oceanic and Atmospheric Administration has the primary public responsibility, but other agencies and the military also have forecast systems. Instead of one central facility, the United States has a wide diversity (there is a residual fear of "central planning"). Agencies and Congress control agendas and budgets, and funding is rather uncertain from year to year. Forecast centers are motivated more by institutional concerns and financial pressures, rather than being driven by a scientific vision. The result is the kind of chaotic inefficiency we are all very familiar with in U.S. government. The diversity is often good for innovation, but the lack of thoughtful long-range planning, committed funding and careful scientific review of progress have caused the United States to fall behind in this challenging area of global modeling. We have huge resources, but it is so difficult for us to plan wisely. But we have to understand and model our human impact on the earth. This is a global endeavor, because our impact now is global. Fortunately we have other organizational examples around the world. We are one world, and we are coming up against many limits in terms of resources. We must broaden our sharing of resources and ideas and reach out to help each other in all the ways we can. Back in July, I talked about the wet weather we were getting; and how more precipitation gives more evaporation, which gives more precipitation. 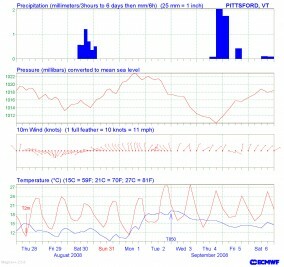 This pattern continued into the first half of August, helped by the position of the jet stream over us. After two months of above-normal precipitation, the ground was saturated, mist rose from the forests in the mornings and the cloud cover was extensive. Consequently the daily maximum temperatures were lower than usual, and with less sunshine, plant growth was slower. Afternoons were dominated by heavy rain from showers and thunderstorms, and flooding washed out many roads. At times I felt like I was in the Amazon in the rainy season ? and I could hardly work in the garden because of the mosquitoes! The weather pattern shifted two weeks ago, just about the time I left for England, and the recent sunshine has been great for our gardens. 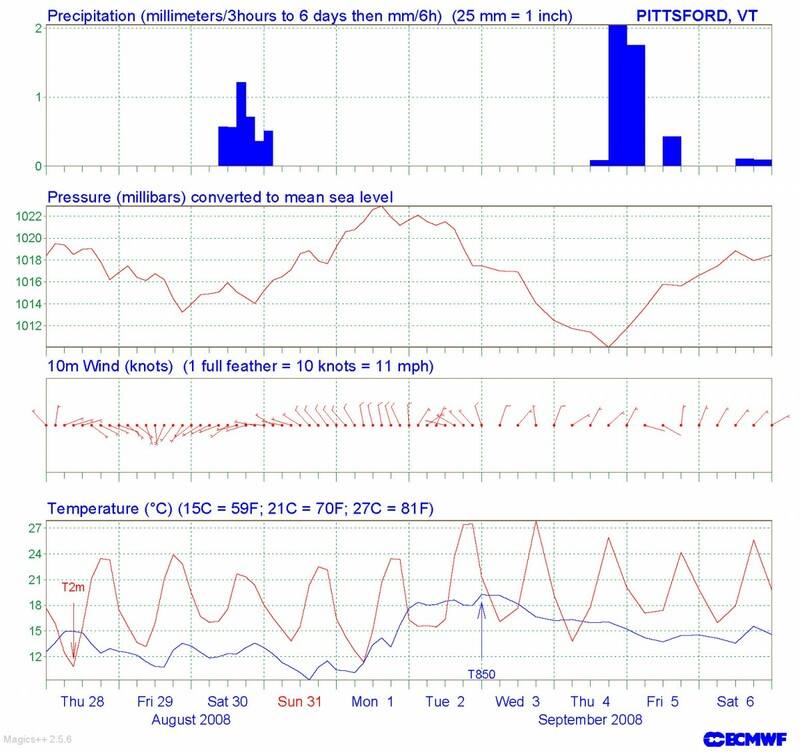 This column was written in time for press last Thursday, so here is Thursday's 10-day forecast from the European Weather Centre for Pittsford, Vermont. Is it any good for this weekend?